Global franchise operator, Salad Box, has opened its very first restaurant in Douglas, Co Cork. Located at Unit 9, Douglas Village Shopping Centre, the restaurant is the first in a number of outlets the brand is planning to open this year in Ireland. Salad Box already has a presence in twelve countries, with sixty-eight trading locations on three continents. 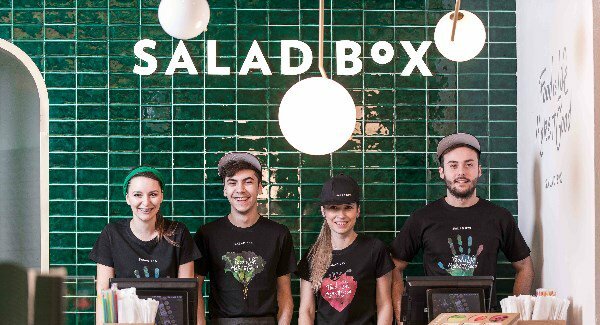 With existing stores in New York, Miami, London, Barcelona, Amsterdam and Budapest, Salad Box plans to open in twenty locations in Ireland over the next three years. Created five years ago by Dan Isai, Radu Lupas, Daniel Lar and Vlad Lupas, Salad Box is the third largest fast-food restaurant chain in Romania, after McDonald’s and KFC. The first restaurant was opened in Cluj-Napoca, and since 2013 Salad Box has developed a franchise system based on clear procedures and a scalable business model, which allowed a rapid expansion of the business at a national and an international level. Mike Kelly, Managing Director of Salad Box Ireland, explained more about the company and plans for developing Salad Box in the Irish market. "Our opening in Cork will be followed next month with two openings in Dublin. We see great potential for steady growth in the Irish market. Our salad and wrap menu has been created from recipes of the world, and in addition to these we offer smoothies, juices, soups and desserts all made fresh in our kitchen each day." He also discussed why Douglas was chosen for the first store opening: “Douglas Village Shopping Centre was a natural place for us to open our first Irish store. We have a fantastic franchisee partner for Douglas in Mickey and Eilis Howard.